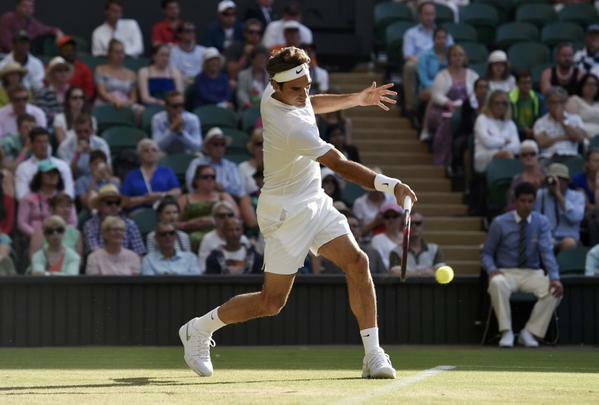 Needing just an hour and twenty-six minutes, Roger Federer dominated Roberto Bautista Agut to reach his 13th quarterfinal at Wimbledon. The 7-time champion broke early and often, and backed it up with high percentage serving, firing five aces and winning 92% of points on his first serve in the opening set. The Spaniard took a scary fall while lunging out to retrieve a forehand, but after calling the trainer, continued to play. Federer accelerated through the match, defeating Bautista Agut 6-2 6-2 6-3 to set up a quarterfinal against tricky Frenchman Gilles Simon. After taking out Monfils on Centre Court under the lights on Saturday, Simon defeated Berdych 6-3 6-3 6-2. After having to play back to back matches against big servers in Sam Querrey and Sam Groth, the 33-year-old Swiss was able to play much more aggressively against Bautista Agut, who prefers staying at the baseline. Federer routinely came forward successfully, winning 30 of 40 points at net, along with 38 winners to 12 unforced errors over three sets. Federer will face Gilles Simon on Wednesday.